After having the head cook, Donna Fong, from Butcher’s Daughter BBQ, as my assistant for the last three contests, we decided to split our forces and challenge ourselves. 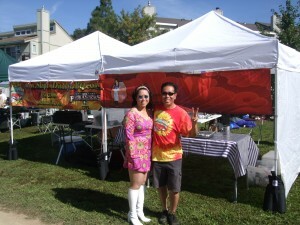 At Ribstock, Peace, Love and BBQ, we cooked separately as solo cooks in this 2nd year NorCal event. After agreeing that less is more, and wanting to making traveling to contests easier, both Donna and I have decided to cook with one WSM each at contests going forward. For NorCal contests, we will begin using her equipment entirely. For SoCal contests, we will use my equipment, but again, cook as two separate teams. 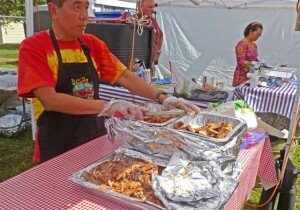 We will still use our own rubs, sauces, mops, and injections, but the equipment and most of the meat will come from the pittmaster that lives closer to the contest site. We had met Damon “Mak” Lomelo of Smokaholics from La Mesa last year in Vista and were inspired by his low profile approach combined with infectious enthusiasm. Mak and his wife cook on one 18.5” WSM, bring two pop up tents, cook PC and are able to fit all of their equipment and themselves into a Honda Fit! At Vista, Mak walked three times to the podium to collect his trophy! We thought, if Mak could do it, so could we. So at Ribstock, we reduced the number of smokers down to one 18.5” WSM, just like Mak. But because we carry equipment for two teams, we couldn’t make it all fit into what would normally be classified as a compact car by most rental car agencies. So Mak will still be the king of the compact. So with all of Donna’s equipment packed into a rented Toyota Sienna, we headed off to Ribstock after she was done with work. Unfortunately, a fatal motorcycle accident turned a 2hour trip to a 3.5hr trip and we rolled in around 9:30pm. Working quickly in the darkness of night, we had our butts and briskets in the smokers within an hour. Thankfully, the smokers, the weather, and the meat all behaved and the cook went smoothly into the next day. The long meats came out in the morning and the chicken and ribs went into the single smoker without a hitch. After all four meats were turned in, we prepared our booths for people’s choice, when we served SYD barbeque to the public in exchange for tickets. This was a 50/50 split where $1 goes to the team and the other $1 goes to the organizers. Our popularity from television made lines long and food was easily gone. There were even a few judges and competitors in line! An experiment in the chicken category didn’t pay off for us and I fell to 19th place for my way overcooked cornish game hen. But it won’t stop me from trying it again in the future. SYD was 8th in pork ribs, 13th in pork shoulder and a disappointing 19th in brisket. Finishing 12th overall was my worst performance of the year. I even got beat by my girlfriend Donna who finished third overall, with a first time, first place finish in beef brisket. 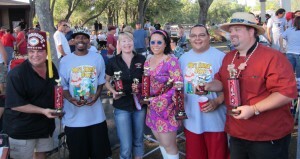 Amazingly, the top 4 rookies for California finished in first place in each of the four meat categories (Who’s Smoking Now, Butchers Daughter, Woodhouse BBQ, and Huminie’s Hogalicious BBQ). Well done! I’ll have to step it up next time and be less distracted by her 70’s gogo outfit, complete with shiny white gogo boots. Top 4 ROY teams finish 1st in each meat category!